Four Vietnamese pupils will participate in the Intel International Science and Engineering Fair (Intel ISEF) that is scheduled to take place in San Jose, California (the US) in mid May. Tran Kim Thanh Vu and Dinh Thi Thu Ha from Da Teh High School in the Central Highlands province of Lam Dong will make a presentation on the organic waste treatment that, they say, will change the habit of waste collection and treatment in households and the awareness of people, especially pupils, on environment protection. Meanwhile, Doan Thi Xuan Phuong, another pupil also from Lam Dong, will present a paper on how to use toads to kill insects. The paper is expected to help address the foodstuff hygiene and safety issue caused by insecticide residue. 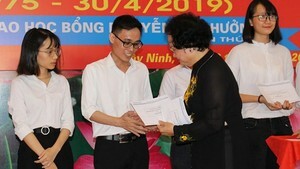 Nguyen Van Ha Uy, a 12 nd grade pupil from Le Quy Don High School in the central city of Da Nang , will try to persuade organisers with a new method to measure two points in space. This year, Intel ISEF, the world’s largest pre-college science fair, will gather more than 1,600 pupils from 59 countries and territories, to compete for awards and scholarships worth nearly 4 million USD. This six-day event is an extraordinary opportunity for Silicon Valley companies to establish corporate name recognition, nurture future technology development and encourage advanced education. Competition in 17 science and engineering categories demonstrates understanding of scientific fundamentals combined with creativity in project areas such as energy, transportation, environmental science, medicine, health sciences, chemistry, behavioral and social sciences among others.